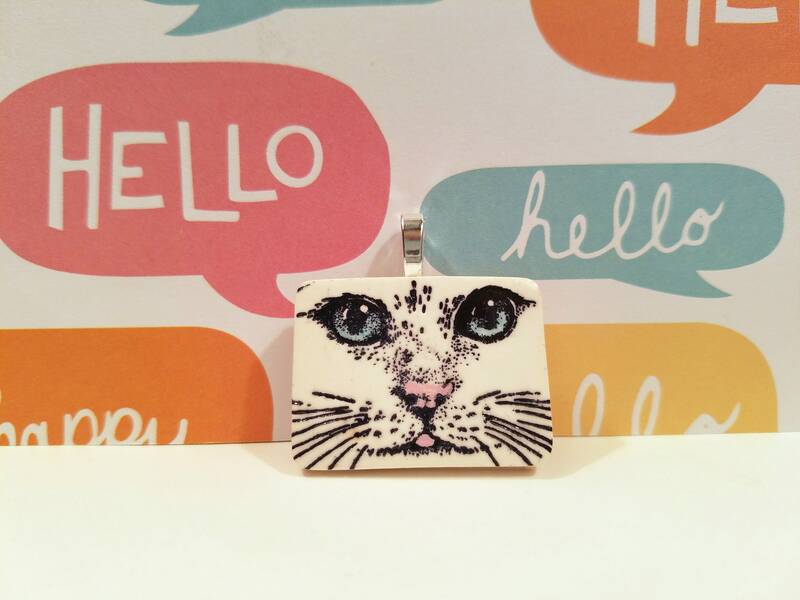 This white cat face pendant / optional necklace or pin/brooch makes a sweet gift for the cat lover. It's handmade of white polymer clay with design stamped in black ink. Your choice of green, blue or gold eyes. Color added with acrylic paint, sealed with glossy acrylic varnish. Lightweight. ★ ★ Pendant, shown in photos, is finished with a large silver-plated aanraku bail. Measures about 1 1/2" wide x 1 1/2" tall. Optional: add a silver plated 18 inch ball chain with lobster clasp. This is a unique, high quality item for the price. Shipping was very fast. Nice packaging. I would do business with this shop again. I love these cat pendants!!! Very well made, fun and unique!! !